:04 - Both have red eyes, but particularly Dan. Tired or more emotional than they let on? :22 - "This London apartment"
:27 - They've lived "just in this apartment" for half a decade. :38 - Flashback pic to when they moved in. 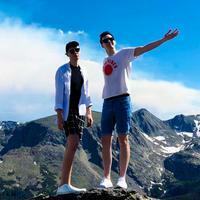 :42 - Phil says Dan looks half-fetus-y. 1:04 - Phil does his hamster impression then gives Dan the biggest, brightest smile. 1:11 - Jumpcut after the hamster cage joke. 1:18 - First reason for moving: too much stuff. 1:28 - Terrifying Dil head. 1:38 - Crate with flower crowns instead. 1:52 - Dan is up for minimalism. Phil needs his knick-knacks. 2:16 - "Phil, you just said we're being penetrated from three angles." 2:24 - Phil tapping the back of Dan's head to mimic the drill. 2:44 - Phil dreaming about frolicking with a (gender neutral) celebrity. 3:38 - Strange noises downstairs, phone goes off and is never answered to the left, through the wall from the gaming channel is a bedroom. 4:22 - Final reason: imminent collapse. 4:34 - [crack-cam] probably a video frame effect they already had for personal use. 4:48 - Crack in the lounge. 5:44 - I love that they love mice. 6:10 - Broken slats. Impressive, guys. 6:30 - Competition between them to jump and touch the ceilings. 6:41 - Shot of messy clothing with no explanation where in Phil's room it is. 6:44 - Dan at the piano, confirms he's going to buy another one. 7:02 - Dan: This video background is coming with me. 7:15 - Phil acts like he's going to open the drawer under Dan's bed. I wasn't aware this existed. 7:18 - Anxious ramble from Dan before he asks Phil to stop filming, Phil immediately does. 7:24 - Phil films Dan lying on the ground. 7:35 - Unnecessary pan across Dan's crotch. 7:36 - Glass kitchen door. 7:51 - They're keeping the sofa. Don't actually understand why. Did they just have some super memorable orgasms on it or something? Only plausible excuse. 7:56 - They will not miss the coffee table. Lengthy ramble about the injuries they got from it. Are they aware they could have replaced it sooner? 8:15 - Green paint from the DAPC video. 8:20 - Gaming room. Dan's posture in the chair is really cute. 8:36 - Bathroom. Dan has a cross-stitched ornament a fan gave him that is based on this tweet. 8:40 - So many stairs, so many stairs. 9:07 - Starts off with Dan looking to the side, dimple on display. Phil confirms they are staying in the London and keeping most of their stuff, just moving somewhere with more space. 9:10 - Dan and Phil both agreeing that they won't miss the place. 9:25 - Phil's smile over the next few seconds. He's so damn happy. 9:33 - They seemed to have made moving before summer a goal. 9:54 - Flashback to wardrobe video. 10:08 - Dan says new place will look exactly the same but in a new building. 10:18 - "Such an ugly bed." Dan has a lot of opinions about... Phil's.... bed.